Nat Segaloff has known Harlan Ellison for 20 years and, for decades before meeting him, enjoyed reading his work. Their first close encounter was when he interviewed Ellison for his A&E Biography on Stan Lee. 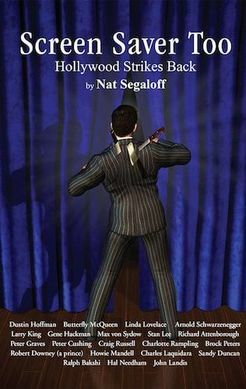 After that, Ellison appeared as an actor in The Waldorf Conference, a play Segaloff co-wrote about the origins of the Hollywood Blacklist. Segaloff conducted exhaustive interviews with Ellison over the course of five years and also spoke with many of his friends and enemies in an effort to get inside the man and pin down the best-known “Harlan stories.” Their wide-ranging discussions cover his bullied boyhood, his storied marriages, his fabled lawsuits, and his compulsive writing process with more depth and detail than has ever before appeared in print. But it also delves deeply into the man’s deeply held principles, his fears, and the demons that have driven him all of his 82 (so far) years. Friends, colleagues, and admirers such as Neil Gaiman, Patton Oswalt, Peter David, Robert Sawyer, Michael Scott, Edward Asner, Leonard Nimoy, Ed Bryant, Alan Brennert, Robert Silverberg, and many other notables add their voices. ​If you enjoyed Screen Saver: Private Stories of Public Hollywood, a memoir by former movie press agent-turned-film critic/producer Nat Segaloff, he now unlocks the La La Land Laundromat to show the dirty laundry left behind. More celebrity stories, as well as richer anecdotes, reveal how the television, radio, and studio industries really work. Anybody thinking of going into the entertainment industry take caution. Segaloff's other books include biographies of directors Arthur Penn and William Friedkin, screenwriter Stirling Silliphant, and Final Cuts: The Last Films of 50 Great Directors. He was also a founding partner, with John de Lancie and Leonard Nimoy, of the science fiction production company Alien Voices. He lives in Los Angeles ducking phone calls. Along with John de Lancie and Leonard Nimoy, Nat co-founded the science fiction production company Alien Voices and produced several adaptations of sf classics featuring Star Trek® actors.